44 pages. Volume 200, number 2. 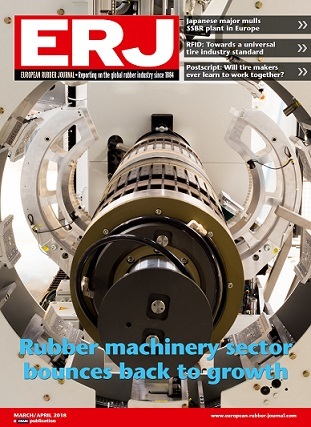 Title on cover: Rubber machinery sector bounces back to growth. Features: *Annual study reveals retun to growth across the sector* Kobe overcoming silica challenges* Company listings* Injection moulding: Automation technologies driving the market* HF unveils the One machine* Trinseo looking for closer cooperation with clients* Asahi Kasei eyes European production base* Uzer Makina gains new markets* Special reports: Sibur leveraging SR capabilities abroad, Automation in curing process* Industry data page* Postscript: New mobility: Will tire makers see the light?. European Rubber Journal magazine has been reporting on the world's rubber industry since 1884. Published six times a year, the magazine provides details of all of the important commercial and technical developments within this business, one of the world's most dynamic and globally integrated industrial businesses.